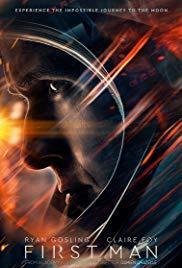 Film critic Roger Ebert is quoted saying, “It’s not what a movie is about, it’s how it is about it.” And this sentiment is echoed beautifully in First Man. Instead of being a dramatic crescendo proclaiming the unstoppable force of American patriotism, this film is a patient, introspective, quiet exploration of Neil Armstrong’s life; an ordinary man who lands in extraordinary circumstances leading Apollo 11, the first manned spacecraft to the moon in 1969. First Man is based on the biography First Man: The Life of Neil Armstrong written by James R. Hansen and first published in 2005. Although this is a distinctly American story, it does not play out like an expected American story. Armstrong is shown as an intensely private man, whose passion for, and extensive experience with, flying often overshadowed his family relationships. Armstrong’s professional relationships with fellow astronauts and scientists were not congenial friendships of camaraderie but plaintive and heavily stressed under the constant possibility of death. This film is memorable because it tells this story in the simplest most realistic way with uncompromising, almost strict, emotional honesty. And it’s this honesty that will make viewers think of this famous man’s life differently. First Man is directed by Damien Chazelle (Whiplash, 2014) who won the Best Director Oscar last year for the 2016 film La La Land. He might need to make some extra shelf space for some new awards.